Back in 1991 Mazda’s design team sat down and got to work creating what would become one of the most timeless and ground breaking sports cars ever to be produced. Using unique flowing lines, angular highlights and a never seen before “fighter jet” inspired design, they produced a what could still today be passed off as one of Mazda’s latest models. It was as revolutionary as it is timeless… a true game changing weapon launched into the World’s sports car market. Throughout its 11 year lifespan, the RX-7 went onto to break numerous records and set new benchmarks in multiple performance and handling categories globally. Using a 1.3L “Wankel” designed 13B rotary engine and 2 turbochargers, no other manufacture was close to achieving these bhp/litre figures at launch. In it’s standard form, the tiny 13B engine was churning out 255hp to 265hp but also mounted to what is still considered today as one of the most competent and balanced chassis ever created. As is the all to familiar story- when you hear of a “special” or “limited edition” model, it generally refers to a few cosmetic styling changes, a fresh set of wheels and a shiny new badge on the rear. Mazda though really did make a “special” “limited edition” with its final run of FD RX-7’s off the production line. Dubbed the “Spirit R”, Mazda went back to drawing board and yes you did get those cosmetic changes and yes you also got a nice shiny badge. But it didn’t end there…the Spirit R packed a lot more punch under its new dress too! 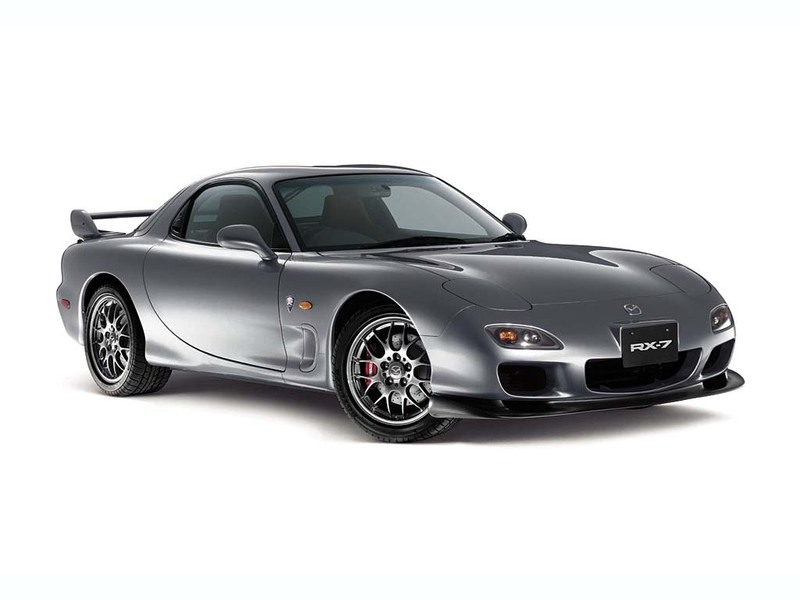 With just 1000 examples produced, the Spirit R Type A was the lightest and most powerful RX-7 variant to ever be produced and the one this article focuses on. Power was increased to 276hp with the help of revised turbos and its kerb weight reduced to just 1270kg. Larger brakes were fitted all around, light weight forged BBS staggered rims added and stunning single piece kevlar carbon Recaro seats transformed the interior. Bilstein suspension and additional strut bracing strengthened the already exceptionally direct chassis and finally an individually numbered limited edition “Spirit R” build plaque was fitted to the engine bay. So Did It All Work? To put its performance into perspective, Porsche’s road going race prepared 911 996 GT3 Clubsport was lapping the infamous Tsukuba circuit in 1.07.68. The Sprit R – 1.06.47. Costing 1/3 of the price and over 1 second faster round the track – the Spirit R was out performing a specifically track focused flagship model from one the world’s most reputable supercar producers. Well played Mazda! With increasing global attention focusing on Japan’s cult vehicles, the RX-7 also joins the list of desired iconic JDM vehicles. Huge social media coverage, fewer examples remaining and the increasingly popular “drifting” motorsport further boosting desirability for these vehicles. Values of Nissan R34 GTR’s and Toyota Supra’s rapidly on the rise – the RX-7 and in particular limited Spirit R models are going the same way also. Type A examples can currently be purchased from $40,000 to $60,000 and are anticipated to continue rising as the eagerly anticipated arrival of its replacement draws closer… The twin turbo RX-9 expected in 2020. If you find yourself in the fortunate position of looking for a useable and potentially future Japanese classic, Fabcar firmly standing behind its motto “drive something different” would encourage car enthusiasts alike to strongly consider one of these future cults. Get in touch today to discuss importing one of these iconic legends!